SanDisk has built the world's smallest 128GB microSDXC card using proprietary technology, making the stress of mobile back-up a thing of the past. Being shown off at MWC 2014, the SanDisk Ultra microSDXC UHS-I is being billed as the world's smallest microSDXC card with the largest capacity. It should mean people can use their phones and tablets as if storage limitations were never a concern, though it would still work better on video cameras where space is usually at a premium. Designed for Android smartphones and tablets, the new SanDisk Ultra microSDXC card means that you can shoot Full HD video and high-quality pictures until the digital cows come home. Susan Park, director of Retail Product Marketing at SanDisk, said that there's more than a thousand times more storage capacity than the microSD card format that was launched in 2004 with a (back then) huge 128MB of capacity. SanDisk has increased storage capacity of microSD cards 1,000 times over in less than a decade with the 128GB SanDisk Ultra microSDXC card. This required some serious tweeking on the code behind the card. Park said that SanDisk developed an innovative proprietary technique that allows 16-memory die to be vertically stacked in finely sliced layers. It can manage write speeds as fast as 45MB/s which means that it can take advantage of advanced functions such as fast action shots, continuous burst mode and multiple frames per second. The 128GB version is the most expensive of the family of SanDisk Ultra microSD memory cards. It will set you back $199.99 (around £221, or AUS$180), which is on a par, in terms of capacity, with lugging an SSD around. 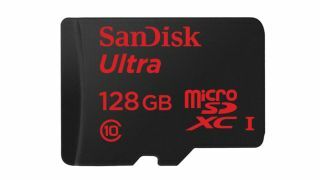 In the US, the 128GB SanDisk Ultra microSDXC card is available exclusively at BestBuy.com and Amazon.com.